Eleanor O'Rourke is the June and Donald Brewer Junior Professor in Computer Science and Learning Sciences. 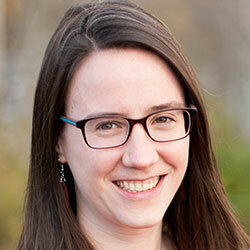 Her research lies at the intersection of human-computer interaction and educational psychology with a focus on developing data-driven systems that support motivation, personalization, and formative assessment in learning environments. Her current research explores the design of interactive systems that promote the growth mindset, encourage playful learning, and foster metacognitive reflection through personal data. Her interventions have been used by over 100,000 students online, adopted by companies, and used in classrooms. She has also won several awards and scholarships, including the Google Anita Borg Scholarship and the Microsoft Research Graduate Women's Scholarship. Nell received her Ph.D. in Computer Science & Engineering from the University of Washington in 2016. Sarah Lim, Joshua Hibschman, Haoqi Zhang, Eleanor O'Rourke (2018). Ply: A Visual Web Inspector for Learning from Professional Webpages. Proceedings of the ACM Symposium on User Interface Software and Technology (UIST 2018). Conference on Human Factors in Computing Systems (CHI 2014). Performance in Educational Games. The First Annual ACM Conference on Learning at Scale (L@S 2014).